The 2-Day Neurotyping System Seminar is for coaches and fitness professionals who design and implement strength training programs and for anyone who wants to enhance their training results. Though hormonal optimization has been a successful approach for training individualization, neural optimization supersedes it given that the neural response will affect the hormonal response, while the opposite is not true. The bottom line is simple: you are more likely to train hard, be focused and stay motivated if you like the type of training you are doing, and a training that goes against your nature causes a greater stress response that hinders optimal progression. This is essentially the founding principle and inspiration behind the concept of neurological profiling for training individualization which lead Christian Thibaudeau to the creation of Neurological and Physical Typing System. 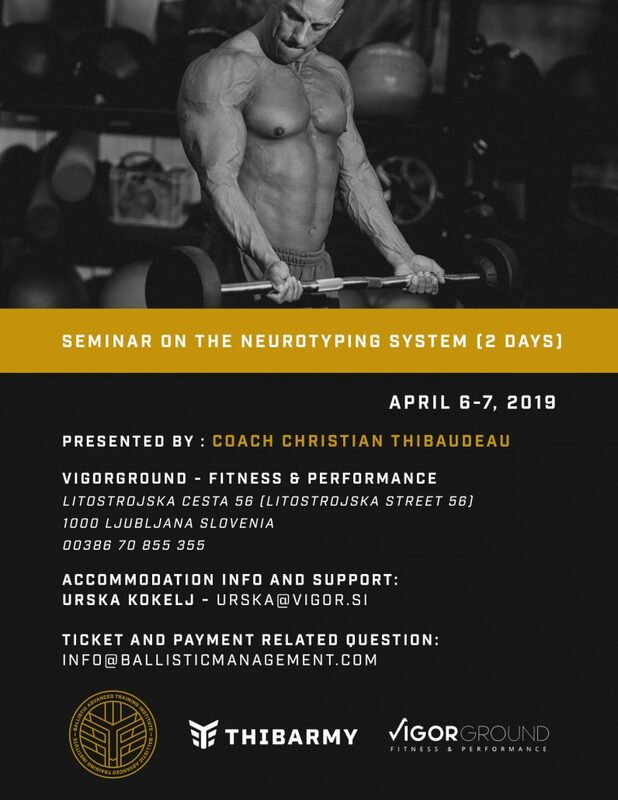 The 2-Day Neurotyping System Seminar will provide you with the know-how to assess neurological type and apply the system to specific goals for short and long-term programming. We are offering fantastic early bird price if you book your ticket now – offer expires on 10th of March! We have limited spots available for the seminar so jump on the link above and reserve your spot now. Change completely the way you train yourself and your clients with this revolutionary system Christian has developed. • A Neurotyping test for free. • An E-certificate of attendance. • A significant discount on Thibarmy Online Neurotyping Certification (149,99$ USD instead of 894.99 USD). *Please take note that everyone who will take the online certification will have access to more than 10 hours of video content. If you will pass all the quizzes and the final exam, you will receive a certificate of achievement by email (as opposed to certificate of attendance). Need help with accommodation? Send an email to Urska Kokelj at urska@vigor.si. For additional payment information contact Klemen Štembal at klemen@vigor.si. 2.3 Can You Change Your Profile?